Hi there! Welcome to the 16th week of our DIY Craft Party! This party is so much fun and not only for crafts but also for recipes, blogging/business/life tips and other instructional posts. Let’s party! It’s the beginning of a new year and we all tend to do a little more organization than throughout the year. Today I am showing my favorite three organizing tips and ideas that you can make! But, before we party, I want to show off my three favorites from last week’s party! PLEASE spread the word about this party!! Closets tend to get messy at times, I know oh so well because I have kids and a husband haha… Erin from Suburban Simplicity knows what she is talking about when it comes to organization! Her post Closet Organization: Simple Tips for A Tidy and Fresh Closet shows some really doable things to keep it nice looking! I especially love what she is putting into shoes to keep them smelling fresh! 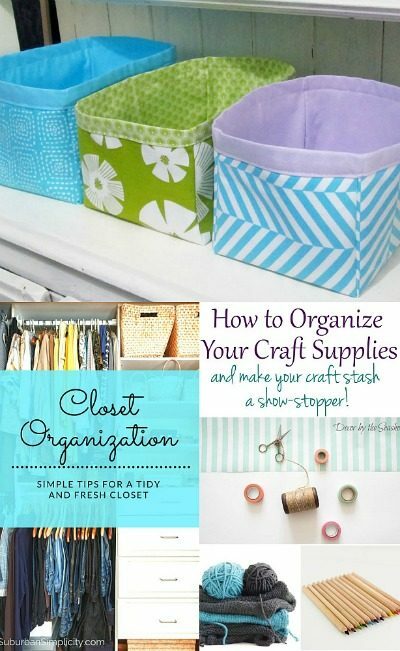 Celeste from Décor By The Seashore shows us how to organize your craft supplies! Awesome ideas!! She even has a complete pinterest board dedicated for ‘craft rooms & storage ideas’. I am in dire need of organizing my sewing room, that’s for sure! Now it’s time to start a new party! Thanks so much for the feature! I always enjoy partying with you! Hi Denise, so glad to be back with you tonight with other lovely guests. Great features and lots of wonderful ideas. See you next week! Thanks for hosting the party. Funtastic Friday is live. Hope you and your friends join us. Thanks for hosting Denise!!! Have a lovely weekend! Denise, thanks so much for hosting! Happy Friday and have a wonderful weekend! Thanks for featuring my boxes!